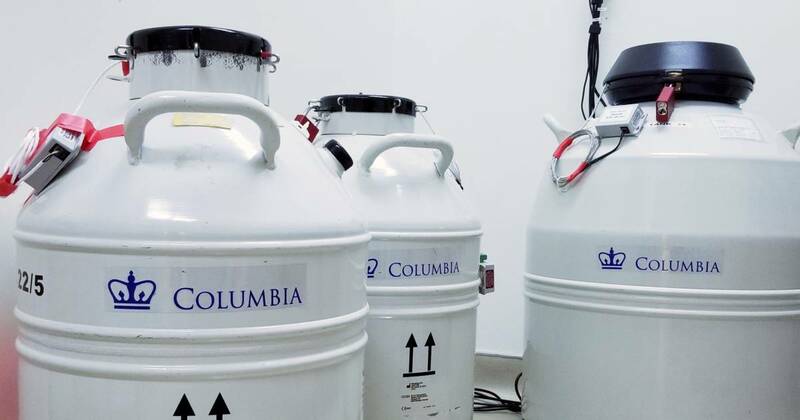 After the failures, Dr. Zev Williams, division chief at the Columbia University Fertility Center, which is not one of the clinics that suffered malfunctions, looked for a way to prevent future storage losses. “Even one failure is too many,” he told NBC News this week. His solution? A high-tech scale. He explained that storage tanks are filled with liquid nitrogen, which helps keep the human tissue at the required freezing temperature. Tank failures generally involve a breach in the insulation or some other tank puncture that allows the nitrogen to seep out. Most fertility clinics now rely on a thermometer in the storage tank that is hooked up to an alarm system. When the temperature starts to rise, an alarm goes off. However, Williams explained, the nitrogen needs to be close to empty for the temperature to rise. By then, there’s little time to save the frozen tissue. The high-tech scale Williams and his team created sends an alert when the weight of the tank starts to drop, an indication that nitrogen is leaving the tank. Depending on the size of the tank and severity of the breach, a weight-based alert could give clinics anywhere from a month to a few hours more notice than the temperature system. This would make emergency measures to save the tissue far more likely to succeed, Williams said. The scale is sensitive to even the slightest change in the weight of the tank. In the storage room at his clinic, Williams tested the scale and its alert system. He walked up to a large tank sitting on the scale and hooked up to a monitor on the wall. The monitor read “0.0,” indicating a safe weight. Williams took his pinky finger and gently lifted the tank by one of the handles. As soon as the tank moved up and off the scale, the numbers on the monitor began to drop into the negative range. Within seconds, his phone buzzed and an alert popped up. As much confidence as he has in the scale, it’s meant to work in tandem with the temperature alarm system for an extra layer of protection. Most clinics use only a single temperature system, he said, yet all tank failures he’s aware of involved a weight change before the temperature change. “We aren’t suggesting this as a replacement. This is an add-on that could be implemented quickly,” Williams said. Most of the over 4,000 samples of human tissue lost in March were at University Hospitals in Cleveland. The clinic sent a letter to patients explaining a number of possible reasons for the failure, including that the alarm system was off and that the autofill feature of the liquid nitrogen was not working, requiring staffers to manually fill the tanks. The other clinic, Pacific Fertility Center in San Francisco, attributed its failure to the loss of liquid nitrogen in the tank. University Hospitals and Pacific Fertility both declined to comment on whether the scale could have prevented their storage failures. Dr. James Grifo, director of the division of reproductive endocrinology and infertility at NYU Langone’s Fertility Center, said the scale sounds like a strong prospect for preventing tissue loss. “I’d consider it, for sure, along with other options,” he told NBC News. He said that his clinic already has three alarm systems in place, two monitoring temperature and one monitoring pressure, but that such backups aren’t as common in clinics as they should be. “For clinics that don’t have a backup system, this could give them a level of security they don’t have,” he said. The losses in Cleveland and San Francisco sent shockwaves through the industry, he said, and should cause every clinic to reassess its safety procedures.